The Baseball Player, this Norman Rockwell painting, appeared on the cover of Collier's published June 28, 1919. This was the fourth and last cover by Rockwell to appear on Collier's and the last of four in 1919. 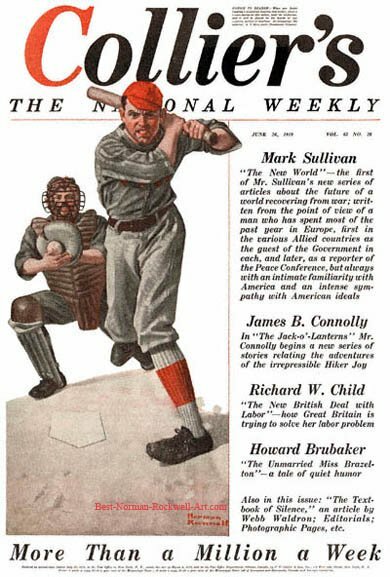 Only four Rockwell covers were published by Collier's. All were published in 1919. Rockwell only submitted to this smaller magazine after the publishers of the more popular magazines had declined to publish that particular cover illustration. Rockwell's preference and his first choice of publication was The Saturday Evening Post. He believed, and his career showed, that the cover of the Post was America's biggest showcase window for artists.If you like The Baseball Player, here is our list of Norman Rockwell magazine covers. There you will find links to all the magazine covers that Rockwell painted. It is late June, and baseball season is in full swing. Rockwell, as was his custom, has painted a topical illustration based on current events. The setting for this illustration is post-swing. The batter has just swung and missed. The pitch looks like a strike, judging by the catcher's position relative to home plate. Strike or not, that wouldn't matter, because the batter has missed connecting with the ball. Clearly the batter put all he had into this swing. The expression on his face shows his frustration with his miss. Rockwell has cleverly concealed the team name from the front of the batter's uniform. He has also omitted the logo from his cap. And, of course, no one can tell which team the catcher represents because of all his protective gear. This may have been because of copyright or permission issues. Or Rockwell may have wanted to avoid making this picture a partisan team painting. The big questions: Was this strike one, two or three? At what point of the game did this scene occur? Was this the red cap teams last chance to win or tie? Fill in your own blanks and enjoy .